"They have really bonded and are going through all those fun roommate situations." 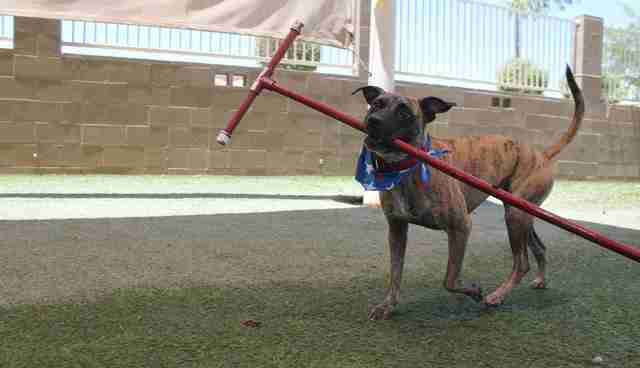 When a dog is brought to a shelter after having a home it can be pretty hard - but one shelter worker is trying to fix that for one very special dog. 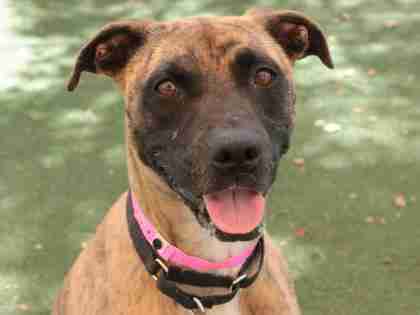 Lana, a 4-year-old bullmastiff mix, was found as a stray when she was just a puppy. The person who found Lana couldn't keep her, and so they brought her to the Arizona Animal Welfare League & SPCA, where she was soon adopted. Unfortunately, after three years of living happily in her new home, Lana was returned to the shelter in April. 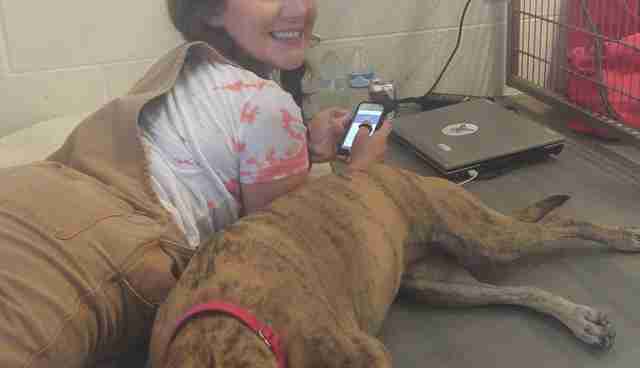 Now, four months later, Lana is still searching for her forever home. 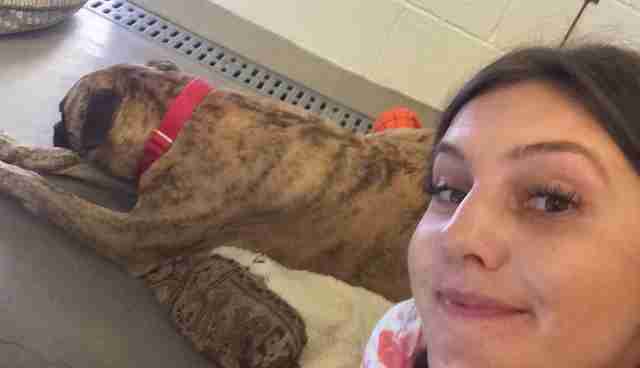 She's having a hard time being back in the shelter after having a home for so long - and so one staff member decided to do something about it. 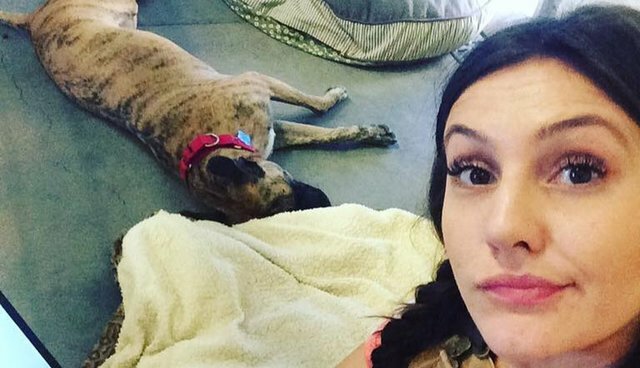 In order to bring awareness to Lana's cause and help her get adopted, Whitney Steele, director of volunteers and events at the shelter, has decided to stage a sit-in. She will be living with Lana in her kennel, 24 hours a day, seven days a week, until Lana finally has a home once more. In order to really understand what Lana goes through every day, Whitney is living exactly as she does - meaning that when she sleeps in the kennel with Lana, she sleeps on a dog bed instead of a cot. "Whitney is learning a lot about what Lana goes through every day, and even though we have an amazing facility, it's not a comfortable, loving home," Michael Morefield, marketing and communications manager at the Arizona Animal Welfare League & SPCA, told The Dodo. "Even after one night, Whitney has really taken that to heart and misses home, and Lana has been doing this every day for over four months. That was a hard realization." 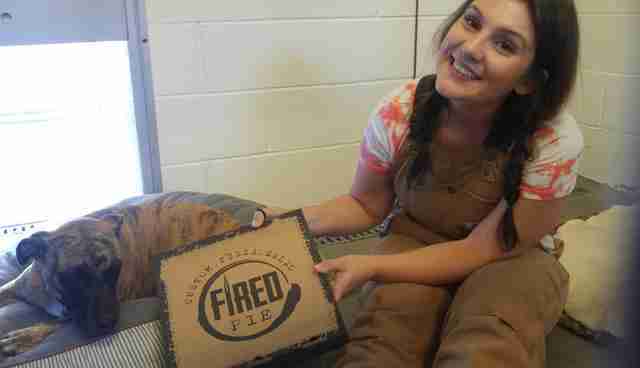 Local businesses have been bringing by food for Whitney (and Lana) while she lives in the kennel, and she's even been holding meetings in there. "They have really bonded and are going through all those fun roommate situations: who ate the last slice of pizza, who stole the pillow, and what to watch on Netflix," Morefield said. The shelter is doing all this to show everyone that Lana is an amazing dog, who more than deserves a second chance at a happy ending. Lana loves going for hikes with the shelter volunteers, and also takes naps with the other workers in her kennel from time to time. She is smart, athletic and easygoing, and would make the perfect pet for any family. She just needs someone to give her a chance. 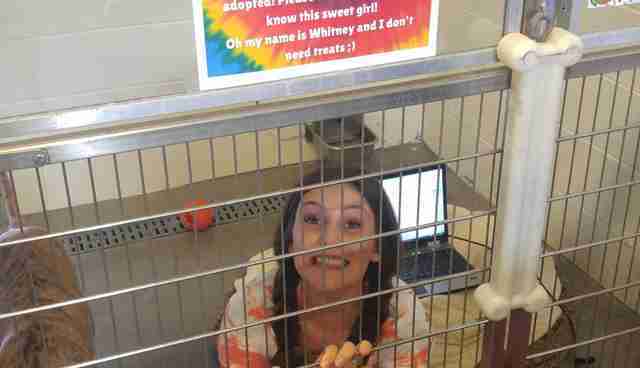 "She is a strong, independent woman who is also really humble, so Whitney is helping show her off," Morefield said. "Everyone needs a hype man every once in awhile, and if Lana is too humble to tell people how great she is, we are going to do it for her!" If you're interested in adopting Lana, you can contact the Arizona Animal Welfare League & SPCA at 602-273-6852 ext. 116.